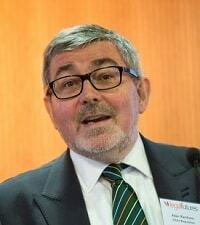 Alan Kershaw, chair of CILEx Regulation, has said lawyers should be regulated “by competence, not by title” and urged the different branches of the profession not to give up on common training. Mr Kershaw, who leaves his post at the end of this month, said titles were “not very important” and “not well understood outside the profession”. Addressing delegates at the Legal Futures Regulation and Compliance conference this week, Mr Kershaw called for what he described as “common stem” education and training for all lawyers. “Attempts to unify arrangements for at least parts of legal training are foundering for the usual reasons, to an extent which was predictable. However, Mr Kershaw said that as a minimum there needed to be agreement on the “portability” of training among the different branches of the profession, when the barriers between them were breaking down. Mr Kershaw questioned why, in the training of lawyers, so little attention was paid to the challenges posed by new technology – the advantages and the risks. Mr Kershaw warned that the financial systems of the western world were brought down by “more and more complicated forms of financial instrument” which those who should have been overseeing the system either “knew nothing about or pretended they understood”. Turning to comparison websites, Mr Kershaw said it was not “beyond the wits” of the legal profession to find a joint way forward. The CILEx chair concluded by saying that a single regulator for legal services was “inevitable as the branches of the legal profession grow together”. Mr Kershaw will be replaced by diplomat Quintin Quayle, a former British ambassador to Thailand, on 1 June 2015.